Bolet's recitals also took him to some warmer climes. For example, on Friday Feb 19th 1960 in Charlotte Amalie High School auditorium in the Virgin Islands. 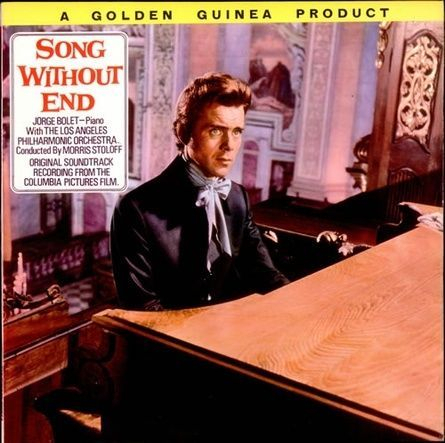 Whenever the name of Jorge Bolet is mentioned, someone will usually remember that he provided the piano playing (he was described as the ‘piano ghost’) for Dirk Bogarde in the biopic about the life of Franz Liszt. Indeed this may be the only thing that is recalled. It was a tremendously big ‘break’ for him but it did not lead to even greater things. Van Cliburn (born in Louisiana, 1934 and educated at Julliard) had been the first choice for the studio, Columbia Pictures, the pianist of the hour. The first International Tchaikovsky Competition in 1958 was an event designed to demonstrate Soviet cultural superiority during the Cold War, on the heels of that country's technological victory with the Sputnik launch in October 1957. Cliburn's performance in the finale on 13 April earned him a standing ovation lasting eight minutes. When it was time to announce a winner, the judges were obliged to ask permission of the Soviet leader Nikita Khrushchev to give first prize to an American. “Is he the best?” Khrushchev asked. “Then give him the prize!” Cliburn returned home to a ticker-tape parade in New York City, the only time the honour has been accorded a classical musician. ‘Doing the soundtrack was a real plum, and I owe a great deal to Abram Chasins for my doing it. I had previously done quite a bit of work with him. He sort of took me in a time when he thought something had to be done about my playing. And indeed he really sort of turned my playing around, so to speak, but that’s another story.’ He worked for close on four years with Chasins. 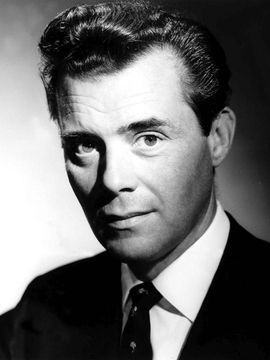 When Bogarde was the castaway on the BBC’s long-running radio programme Desert Island Discs, broadcast on Monday 28 September, 1964, his third choice of music was: Franz Liszt, Piano Concerto No 1 in E Flat / Hungarian Fantasy with Jorge Bolet & Los Angeles Philharmonic Orchestra under Morris Stoloff. Interestingly, when he was invited back in December 1989, he chose Liszt's Piano Concerto but played this time by Lazar Berman! One year later (1961), Bogarde was to star in a very different film, Victim, ‘a drum-tight thriller with a neat twist in the tail’. One of the co-writers of the screenplay was Janet Green – a thriller/whodunnit specialist who counted Midnight Lace among her credits – and it was directed by Basil Dearden. A successful barrister, Melville Farr (Dirk Bogarde) has a thriving London practice. He is on course to become a Queen's Counsel and people are already talking of his being appointed a judge. He is apparently happily married to his wife, Laura (Sylvia Syms). Farr is approached by "Boy" Barrett (Peter McEnery), a younger working class man with whom Farr shared a romantic but asexual relationship. Farr rebuffs the approach, thinking Barrett wants to blackmail him about their relationship. What Farr does not know is that Barrett himself has fallen prey to blackmailers who know of their relationship. ‘It carried an ‘X’ certificate, which to the fans of its star, Dirk Bogarde, seemed decidedly odd. His reputation as the idol, not just of the Rank Organisation’s flagship cinema but of all the country’s Odeons, had been based largely on performances as Dr Simon Sparrow and Sydney Carton, and in other undemanding fare...’ (John Coldstream, The Spectator, 3 September 2011). In 1961 Bolet recorded a Chopin recital for the Everest label. This was a drastic year in Cuban-American relations. The United States wanted Castro out of power. In one attempt to overthrow Castro, the U.S. sponsored the failed incursion of Cuban-exiles into Cuba in April 1961 (the Bay of Pigs Invasion). In 1962, Cuba was the centre of world focus when the U.S. discovered the construction sites of Soviet nuclear missiles. The struggle that ensued between the U.S. and the Soviet Union, the Cuban Missile Crisis, brought the world the closest it ever came to nuclear war. On 25 March 1961 he gave a Beethoven 4 with London Symphony Orchestra and Charles Mackerras. The Times describes it as ‘so satisfying...most impressively well-judged. Thus the four repeated Fs that open the development of the first movement had their full magical effect: Mr Bolet toyed with them just sufficiently to suggest the indefiniteness of the structural crossroads at which the work stands at this point’. From 26 May to 19 June, 1961 Bolet made his first trip behind the Iron Curtain, to Poland where he gave 10 concerts in six major cities starting in Kraków on the 26th. There were eight concerto dates with orchestra and two solo recitals. During the trip, he played on one of Chopin's pianos. US President Kennedy had called culture and the arts the "great democrat" among men and nations. The opera singer Martina Arroyo had toured Poland in 1962 and received an enthusiastic welcome in Szcezecin, Poznan, Koszalin, Olsztyn, Bydgoslca, Wroclow, and Rzeszow. It may be that Bolet felt some nostalgia on this trip as both Godowsky and Hofmann, inspirational men in his life, had Polish origins. Josef Casimir [Józef Kazimierz] Hofmann, the first Director of Curtis and for whom Bolet played on occasion, had been born in Kraków on 20 Jan 1876. His mother, Matylda, sang in light operas at the Kraków Theatre, where her husband was conductor. At the age of three young Josef learnt the rudiments of music from his father and proved himself to be one of the most precocious musical prodigies in history, and – as it turned out - equally gifted in mathematics, science and mechanics. Felt some nostalgia? Perhaps, but Bolet actually disliked travelling in Poland during the communist regime very much and for his only subsequent concert visit to Poland - a performance with the Warsaw Philharmonic - he (and partner Tex Compton) insisted on leaving the country on the last flight out on the night of the concert. He was unnerved by the constant, very unsubtle surveillance. 1961 was a tense and dramatic time in the Warsaw Pact countries (Soviet Union, East Germany, Poland, Czechoslovakia, Romania, Bulgaria, Hungary and Albania). Reuters reported for the New York Times that on Sunday, 13 August, East Germany closed the border early today between East and West Berlin. ‘The quietness of East Berlin's deserted streets was shattered in the early hours of the morning by the screaming of police sirens as police cars, motorcycles and truckloads of police sped through the city.’ The measures were directed at stopping the flow of refugees from East to West through West Berlin. The flow of refugees has recently been reaching 1,700 daily. On 29 May Bolet performed a big programme of Beethoven’s Sonata Op. 57, Appassionata, Liszt’s B minor and Chopin’s Third Sonata in London. He ‘held his audience enthralled’ but things were ‘less happy’ in the Chopin where hr missed ‘some of the lyrical exuberance of the opening movement and the lightness of the scherzo, though it was taken at a breathtaking speed... In short, the playing was magnificent but it was not quite Chopin’. 5-7 February, with Berliner Philharmoniker, under Witold Rowicki, Bolet preformed his Prokofiev No. 2. In July, Bolet’s mother Adelina died in Dade County, Florida. There is a letter to JB from Audrey Michaels, dated 21 October 1963 and sent to his home in northern Spain (Apartado 5, Fuenterrabia – an address that proves elusive to the modern researcher) about publicity material. In 12 September - 8 October 1964, Bolet toured New Zealand. As a sample of an international concert pianist’s itinerary, we may look at a little of his schedule. Hotel Chalet Chevron; dinner 10 Sept. to breakfast 14 Sept.
NZR bus departs 10.45am arrives 1.45pm. In late October and November of the same year, Bolet made a tour of South Africa including a solo recital in Cape Town. He presumably flew there from New Zealand. This was his first appearance with the Cape Town Municipal Orchestra on Thursday 22 October 1964, in a performance of Liszt’s Piano Concerto no. 1 and his Hungarian Fantasia. Weber’s Der Freischütz Overture and De Falla’s The Three-Cornered Hat constituted the rest of the programme. This was conductor Peter Erös’s final concert in Cape Town; he had studied composition with Kodály and conducting with László Somogyi in Budapest. There is some interesting correspondence about the tour which was organised by the agent Hans Adler. He had left Nazi Germany for South Africa in 1933. His passion was to offer South African music lovers the highest quality of international concert presence. He was Chairman of the Johannesburg Music Society (South Africa's oldest Musical Society) from 1954 through till 1969. The Society was among the first to invite many international artists and groups to perform in South Africa, and quickly expanded. Johannesburg soon became the centre of performers' broad African tours, that included the large cities of South Africa (Pretoria, Durban, East London, Cape Town, Port Elizabeth) as well as visits to Kenya, the former Northern and Southern Rhodesia, Mozambique, the Islands of Mauritius and Reunion, the former South West Africa, Angola and sometimes the former Belgian Congo. On 1 August 1964, the Belgian Congo became the Democratic Republic of the Congo, to distinguish it from the neighbouring Republic of the Congo (Brazzaville), formerly French Congo. Unrest and rebellion plagued the government until 1965, when Lieutenant General Joseph-Désiré Mobutu, by then commander-in-chief of the national army, seized control of the country. It is highly unlikely our dapper Cuban-American in his starched white tie tinkled the ivories amidst such political unrest, rainforests and malaria. "The Johannesburg Musical Society have selected Programme 1 for our first concert (Saturday 17 October) and Programme 2 for our second (Sunday 1 November) etc. Regarding the second part of the South African Broadcast Corporation programmes on 18th October, this should have been about 40-42 minutes of actual music. As Mr Bolet submitted to me only about 27 minutes of music (Beethoven 32 Variations [10´] and Franck Prelude, Choral and Fugue [17´], I added 2 Liszt Etudes, Feux Folets and Wilde Jagd which I presume will be in order. "Regarding visas, this is now really a matter of extreme urgency and I hope that visa applications have already been made by Mr Bolet. In case Mr Tex Compton accompanies Mr Bolet, then he must make a visa application as well. Both these gentlemen must be in possession of valid health certificates against small pox (and possibly against yellow fever). Mr Compton's plane ticket will be deducted from JB's fee." Felix Werder's wacky report in The Age, May 19, 1965! Newspapers refer to Bolet living on the northern coast of Spain in the 1960s. The place was Fuenterrabia, (Hondarribia, ‘sand ford’ in the Basque language), a colourful fishing village situated on the west shore of the Bidasoa River, just on the border with France, and also only half an hour away from San Sebastián. 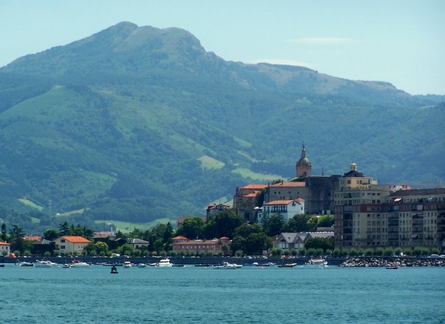 Hondarribia has been settled since the time of the Romans, and became a full-fledged village in the 13th century. 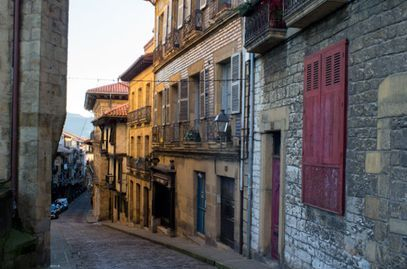 As a town historically on the border, whether between Navarre and Castille, or between Spain and France, Hondarribia has enjoyed a tumultuous past. The town was repeatedly besieged by French and Navarran forces throughout the 1300s up until the Thirty Years' War in the mid-1600s, when Spain and France reconciled their borders under the Treaty of the Pyrenees. After the signing of this treaty (which fixed the French border to its current state), Hondarribia remained a border town, across the Bay from France. Bolet had Falla's Noches en los jardines de Espana in his repertoire, performing it for example in January 1942 in Havana. Manuel de Falla (1876-1946) completed his most famous orchestral work, Noches en los Jardines de España (“Nights in the Gardens of Spain”) in 1916. He attached no specific programme, but the title of the three movements suggest the Spanish pictures that he sought to evoke. 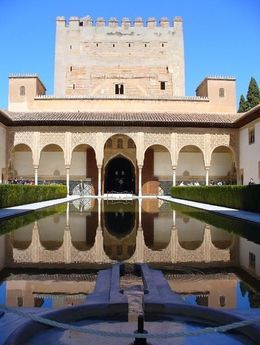 The first movement is called In the Gardens of the Generalife - the jasmine-scented gardens surrounding the summer palace of the king’s harem at the Alhambra. A web-blog in Spanish - which I take on trust but cannot verify, by someone who got to know Bolet and who had visited him in the spring of 1966, states that he was living in the Villa Egoki, an attractive house in the Basque style overlooking the beautiful bay between Fuenterrabia and Hendaya. Is this to be equated with the address he gives in biographical dictionaries as ‘Apartado 5’? He lived there for, perhaps, 6 years in total with Tex Compton. ‘Pierre Loti [pseudonym of Julien Viaud, 1850 – 1923, French novelist and naval officer],who had sailed many seas and oceans, claimed that this bay was the most beautiful piece of scenery on the planet. I arrived at Villa Egoki with Alberto Bolet, and Rosita, his wife. ‘Alberto was as chatty and outgoing as Jorge was quiet - he could almost seem taciturn and introverted. His height and build transformed him into a dark giant (‘gigante moreno’), endowed with a deeply penetrating gaze. I must confess that this penetrating but impenetrable look and the fact that he did not say much had an intimidating effect on me. Later I discovered that when he relaxed, behind those unfathomable eyes there lay hidden an affable, friendly personality and an intelligent conversationalist. The writer then compares their relationship to that of Somerset Maugham and Gerald Haxton. This is an intriguing observation. Frederick Gerald Haxton (1892–1944), a native of San Francisco, was the long term secretary and lover of the distinguished British author W. Somerset Maugham. He and Maugham met at the outbreak of World War I when they both began serving from 1914 as part of the Red Cross ambulance unit in Flanders, France. Later they settled on the French Riviera in the villa ‘Mauresque’. They lived there almost exclusively until they were forced to flee the advancing Germans at the commencement of World War II. Indeed it is thought that Haxton’s flamboyant nature, said to be portrayed in the character Rowley Flint in Maugham’s novella Up at the Villa, was the key to Maugham’s invitational success with the various members of the society at whatever location that the pair was visiting at a given time. ‘Tex, like Haxton, was outgoing and friendly. When we arrived at Villa Egoki he greeted us, smiling, warm and jovial. He could have said he was the host himself. Then he prepared drinks and snacks in the garden, and he served an impeccable lunch. In the garden, peaceful and quiet, no kind of noise reached us, and the warm spring day was very nice. Jorge smoked a lot and spoke little, maybe because he knew what I could only guess - the tense relationship that existed between Tex and his brother. After coffee, we went to the living room, white from the carpet to the ceiling, where a black Bechstein grand paradoxically dazzled. Jorge sat at the piano and in that moment was transformed. He played several transcriptions, wonderful transcriptions by Godowsky of Schubert songs, plus the ballet music from Rosamunde, but offered the surprising confession that his secret dream was to play and record all Mozart's piano concertos. (He never did.). The is in the Bolet archive in Maryland a letter from the UN, 27 July 1967 regarding the invitation from U Thant. We understand that Mr Bolet will travel from Midland, Texas on 21 October to NYC and will wish after the concert to fly to Edmonton, Alberta. We shall take responsibility for these travel costs and also for Mr Bolet's living expenses during his two days or so in NYC. 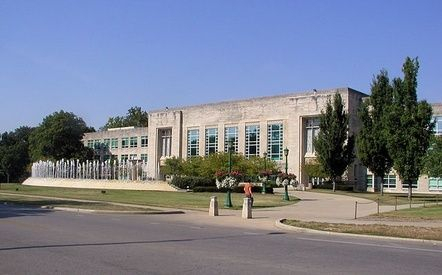 Guy Brackett, who attended Indiana University music school from 1974 - 1977, writes: ‘I did not study with Mr Bolet and only had brief encounters with him. I remember him as an exceedingly kind and modest man. Very quiet. No trace of an ego. I even wondered if he might be shy. In spite of his fame (the Carnegie Hall concert was in early 1974), he wasn't as in-demand as other teachers on the faculty. Among the piano faculty were Abbey Simon, Menahem Pressler (still on the faculty [as of December 2012]! ), Sidney Foster, and Gyorgy Sebok. All of these teachers were more sought after. Mr Bolet was not a “mainstream” pianist and that may have led some students to look elsewhere. He gave a recital during my time at IU, largely playing the same program as the Carnegie Hall recital. From these years, Bolet can be heard in Mozart's Piano Concerto K450 (No. 15 in B flat), recorded with the Bavarian Radio SO under Jan Koetsier, 4 April 1968. It is a wonderfully muscular performance. I had never really wanted to hear him in Mozart but I was most pleasantly surprised. ‘Next was Weber's Konzertstück, with Jorge Bolet as soloist. This delightful piece is not performed often these days, perhaps because of the frankly tear-jerking, heart-on-sleeve story that goes along with it. The pianist must be an incurable romantic to play it: in fact he sounded like one as the performance unfolded. Barring several wrong notes here and there, Bolet's playing was really nice. It's good to hear someone play smoothly these days. There was intelligent use of the pedal and a 'rounded' sound that were just what this little piece requires.’ Milton Zapoliski, Schenectady Gazette. I have never, never, and I use the word advisedly, solved either a major mechanical problem or a musical problem at the keyboard. I practise so much at the keyboard and then have had enough, really like a ruminant. A cow eats so much and then she can go and lie down and chew the cud for hours on end. Well, I'm the same way. Whatever I do at the keyboard gives me enough practice material so that I can practise mentally, for twelve, fifteen maybe twenty hours, whenever I'm awake. I always have something running through my mind. JB speaking in 1986/7 to Linda J. Noyles in the lobby of the Blackstone Hotel, Chicago. Built by the Drake brothers in 1909 and designed by architects Marshall & Fox, the hotel opened in 1910 as the tallest building in Chicago at the time. Noteworthy guests have included 12 consecutive presidents from Taft to Carter, Al Capone, and others. 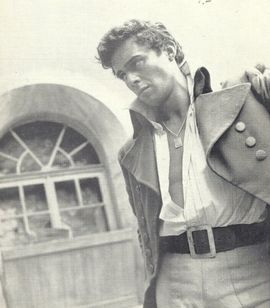 Dirk Bogarde as Sidney Carton in A tale of two cities. 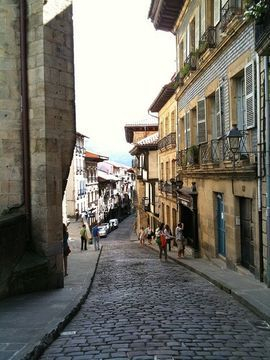 Fuenterrabia (Hondarribia) on the north coast of Spain where Bolet had a home in the 1960s. There exists a 1967 broadcast recording Jorge made in Frankfurt of a selection of the Op. 25 set of Chopin's Etudes. It can be heard above link. I have read somewhere that Jorge's long, thin fingers were not well adapted to the intricacies of some of the Op. 10 set and the only etude he seems to have performed regularly is the beguiling, so-called Black Keys Study, Op. 10 no. 5 in G flat major.